Last month, I asked you lovelies on Twitter to let me know what fall trends or fall related topics you wanted me to blog about this season. One of you lovelies asked if matte lipstick was still a trend. This particular lovely was DONE with matte lipstick. I had to delve a bit deeper into why she felt this way about mattes. I found out that she did not like matte lipstick because it is too drying. I know she is not the only one who feels this way. 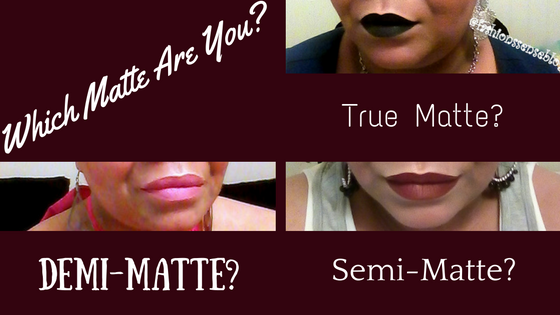 Let me give you matte-weary lovelies some info on matte lipsticks that don't chap your lips. If your only experience has been with flat mattes that have dried your lips, I would suggest that you stick with drugstore choices to see if you truly can handle any type of matte lipstick. Sometimes the liquid lipsticks can be more drying than the solid lipstick. So I recommend buying a liquid and solid semi-matte lipstick and the same for demi-matte. Look for words like satin, velvet, or creamy in the description of the matte lipstick or even in the name. These words are a clue that the matte lipstick is not a flat matte and has some type of moisture content in it. This is not a guarantee because some companies will use these words in naming their product and the product is nothing like that. Don’t you hate it when brands do that?